Often considered a part of a common Christmas tradition, there is more to mistletoe than just kissing under it. Historically known as a symbol of fertility as well as an aphrodisiac, the herb has resurfaced as an effective natural remedy for a number of common maladies in recent years. Its unique origin and active chemical compounds make it a plant of mystery and intrigue as well as usefulness and worth. Mistletoe is a unique plant. Considered a hemiparasite, or a “partial parasite,” mistletoe earns this unique classification as it actually attaches to and grows on another organism, similar to a traditional parasite. After attaching itself to the host plant, mistletoe sends roots into the tree that allow it to collect vital nutrients. Mistletoe is unique in that it is also able to photosynthesize and grow on its own; however, it is most often found growing parasitically to some extent. Mistletoe grows in two main forms: Phoradendron flavescens and Viscum album. The former, Phoradendron flavescens, is the mistletoe often seen and used in Christmas decorations. This species of mistletoe typically grows on the East Coat of the United States. The latter, Viscum album, originated and comes from Europe. Ancient peoples originally discovered this form of mistletoe and believed that it held mystical powers. This class of mistletoe typically has green leaves with sticky white berries and small yellow flowers. The berries of this plant are poisonous. How Does Mistletoe Treat High Blood Pressure? While mistletoe does have more purpose than just serving as décor, it is not the mystical substance that early Europeans thought it was. Mistletoe is actually an herbal substance that is effective for treating a number of health conditions. One of the most important benefits it has is treating high blood pressure. 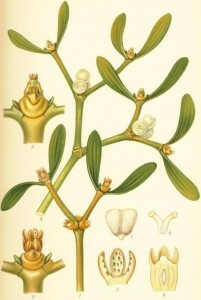 Mistletoe contains a number of potent chemical compounds, several of which are lecithins. These compounds or proteins bind to toxic agents in the body and eliminate infection and other forms of illness. Working in the same way, the treatment alleviates high blood pressure by removing toxic substances from the body and breaking down plaque and buildup in the arteries. Does It Have Other Health Benefits? Mistletoe is not just a treatment for high blood pressure, though. The herb can also be used to treat a wide range of other health conditions. The leaves and stems possess the most beneficial compounds. Additional constituents of the herb include amines, antioxidant flavonoids, and terpenoids. These components work together to give mistletoe its effective potency. Mistletoe can also be used to treat epilepsy, anxiety, fatigue, arthritis, vertigo, and inflammation of the joints. It is also effective for preventing cancer and treating hepatitis, HIV, respiratory disease, hyperthyroidism, diarrhea, gastroenteritis, nausea, gingivitis, and a number of other conditions. The herb can be found in a variety of forms used for treatment; however, such use should be overseen by a trained herbal practitioner. Common usage preparations include mistletoe tea, injectable doses, mistletoe extract, and combined tinctures. The herb is typically not used alone but is paired with other herbal remedies for the most effective remedy. The recommended dosage varies depending on use as well as treatment option. Common treatments for hypertension, however, generally use mistletoe fruit to make a tea with a concentration of 10 grams per day. Common treatments for cancer therapy are delivered intravenously or subcutaneously at dosages between 0.1 and 30 mg several times a week. The common doses can also be given in incrementally increased amounts if appropriately monitored by a trained professional. Like many other herbal remedies and even mainstream medications, mistletoe presents limited side effects. When used as an injection, the site of the injection may appear red, itchy, or inflamed. Likewise, some individuals have experienced systemic reactions that manifested as a mild fever or in flu-like symptoms. A few cases of anaphylactic shock have been reported in conjunction with mistletoe dosing. While mistletoe is considered a safe treatment option by trained professionals, the United States Food and Drug Administration lists the plant as unsafe. As such, mistletoe treatments are best left to professional herbalists. In any case, though, data presents no cause for concern. No interactions have been identified, and the prevalence of side effects has been limited. As the berries may contain toxic constituents, use is not recommended for those who are pregnant or nursing. Many individuals recognize mistletoe as a happy holiday tradition; however, the benefits of mistletoe extend far beyond the holiday season. This unique plant can be used as an effective herbal remedy all year round.